Sarah Kaufman is currently the #5 contender in the women’s bantamweight division and she’s looking to make a big jump in those rankings starting tonight. The former Strikeforce champion faces late replacement Leslie Smith tonight—and opponent she’s not unfamiliar with. 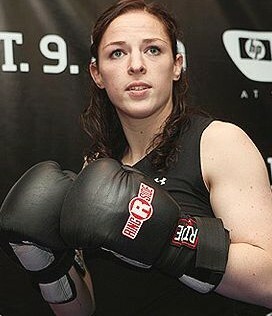 Kaufman just defeated Smith in April at Invicta FC 5. Assuming she gets past Smith yet again, Kaufman already has a plan to get back into the title hunt. She wants to face #1 contender Cat Zingano. Zingano is still working on her return from a major knee injury and has stated that she’ll be ready by mid to late summer. It would be a good matchup indeed, but Zingano is still pushing for the next shot at Ronda’s belt—assuming Ronda still has the belt. Rousey is set to face Alexis Davis next, which could mean Zingano would have to take another fight before getting the title chance. Timing is everything when it comes to rehabbing injuries, so if the timing doesn’t work out to face Zingano, Kaufman would also be interested in fighting the winner of Saturday’s Miesha Tate/Liz Carmouche fight.